Banks, look no further. Crosskey’s PSD2 compliance-as-a-service has you covered with ONE simple and secure integration. Free of charge. The service is part of our Open Banking platform and offers a smooth path to PSD2 compliance without the need to undertake complex integration projects. Download our PSD2 whitepaper to learn more or visit our Open Banking Market for some hands-on. As the leading Nordic provider of banking systems, we are experts in security, simplicity and ease of use with integrated compliance. Our customers include cutting-edge fintech companies and multiple Nordic banks, with an end-customer base of more than 3 million. We now empower our end-customers to take control of their personal financial data and give consent to third-party sharing via Open Banking. It is a cloud-based open service platform for banks, financial institutions, fintech companies that wish to undertake a role as AISP, PISP, CISP. An outsourced plug-and-play solution for banks required to make data accessible in compliance with PSD2. 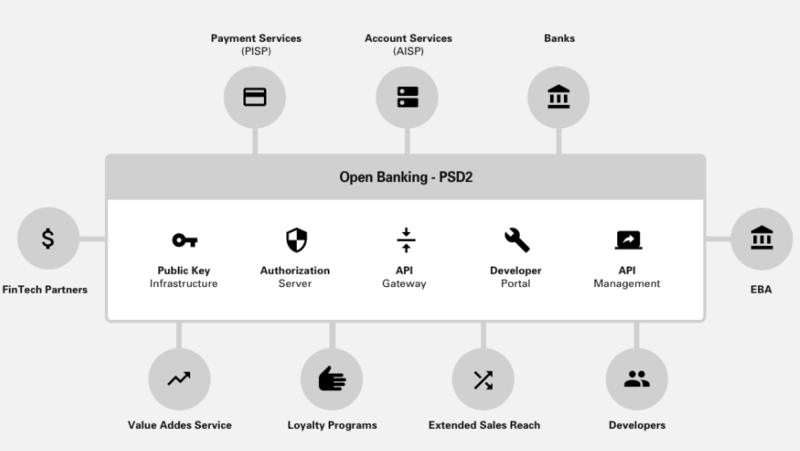 An Open Banking API market linking banks and third parties with data, channels, functionality and opportunities. Makes Open Banking simple, streamlines integrations, reduces complexity and lowers costs for all parties. Enables the creation of new financial experiences, products and services beyond regulatory requirements. Compartmentalised and zone-based security architecture with advanced role management. Platform engineered in adherence with open standards (Open Banking UK and ISO200222) and best practice. I agree that Crosskey registers the above information and gives me information about services and products via email. Read more about our privacy statement.